The biggest bitcoin asics manufacturer and the biggest bitcoin miner has now gained nearly 42% of the network hashrate for the past week. BTC.com’s own stats (pictured above) show they have found 27.2% of all bitcoin blocks during the past seven days. Antpool has found 14.6%. Both are owned by Bitmain. Antpool is operated by Bitmain as well, while BTC.com has its own operations which Bitmain claims are independent, but BTC.com is fully owned by Bitmain. Making it a combined 42% of all network blocks. Moreover, they have further hashrate which they are not currently utilizing on bitcoin, but on bitcoin cash. Both BTC and BCH share the same algorithm, and thus the same mining gear can be used to mine either, but one at a time. 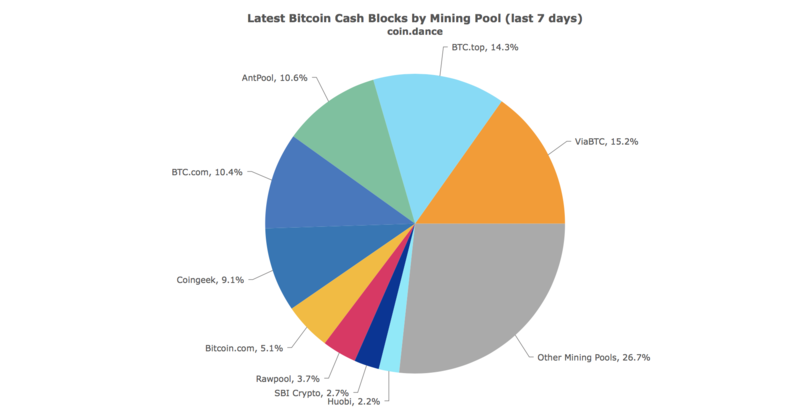 Antpool has 10.6% of BCH’s network share, while BTC.com has 10.4%, making it a combined 21% of all BCH blocks during the past seven days. BCH mining distribution, June 23, 2018. It is a lot easier to mine BCH as it has far lower difficulty. So if all that hashrate was directed to BTC, it wouldn’t give them an extra 20%, but only around 3%. That would make it a total hashrate of 45% within their control, very close to that 51% line which can allow them to reverse history. That doesn’t mean they would. Other mining pools have gained more than 51% of bitcoin’s network hashrate previously. The most famous such event was in 2014 when Ghash managed to gain as much as 55% if we recall well. That led to public calls for miners to boycott Ghash, and eventually they did with it now being irrelevant, but not before a rogue employee within Ghash double spent a small amount. Bitmain is a bit different. While Ghash was a pool where many small miners grouped together to effectively become one miner, Bitmain is one miner. They have their own mining farms for which they produce the hardware, so there wouldn’t be any small miners leaving the pool. That could pose problems for bitcoin, which has no plans to move away from Proof of Work (PoW). Not because Bitmain itself would have any reason to abuse the network, but because they could be hacked, or some employee could go rogue. Their system of dividing themselves into two somewhat independent pools might protect from it, but as both would be under the same ownership there might be room for intentional, unintentional, or coercive abuse. If that does occur, they would not be able to change other’s ownership, except for those parties that are transacting during the double spend attack. They would only be able to double spend their own bitcoins, but anyone else that was transacting at that time would also see a reversal of ownership as confirmed transactions might become unconfirmed. Individuals therefore, if they do get any closer to 51%, would do well to wait for more than six confirmations where significant amounts are concerned. A temporary solution in that sort of situation might be a change of the PoW algorithm. That, however, might significantly lower bitcoin’s security and potentially even increase its chances of being 51% attacked as occurred with Monero after they changed their algorithm. The best course of action for now, therefore, is for Bitmain to start selling more of their asics by lowering prices. This is probably temporary and cyclical, however. Looking at the current distribution it appears some miners are at risk of going bankrupt. That would not be unexpected. To the contrary. During the 2014 downturn, many miners went bankrupt, including some very big miners. That’s because mining is a very risky business which requires upfront investment with two parameters unknown. That being how many more miners would start mining and thus lower your share of rewards, and how much the price of bitcoin would be while you are mining. Bitcoin’s mining hardware (hashrate) has tripled since December, as can be seen above, even while price has fallen by 3x since December. It is now therefore a lot more expensive to mine a bitcoin than in December, while at the same time one mined bitcoin is worth a lot less. At some point miners are unable to afford energy costs or to keep up with adding more and more hardware as their old one becomes useless due to the constant increase of hashrate difficulty. So they close shop. Some miners, however, like Bitman, have lower costs, presumably because they manufacture themselves the mining hardware. So as other miners struggle, like Bitfury which has now dropped to 2%, Bitmain starts gaining more and more hashrate to the point they are now nearing 51%. The above bitcoin hashrate chart, however, even in a common sense way, looks quite unusual because it rarely goes down, if ever. Rather than responding to the price action, the hashrate appears completely detached. A situation that can not go for much longer because that increased new hardware itself puts pressure on price as the new barely profitable miners need to sell everything to cover costs. 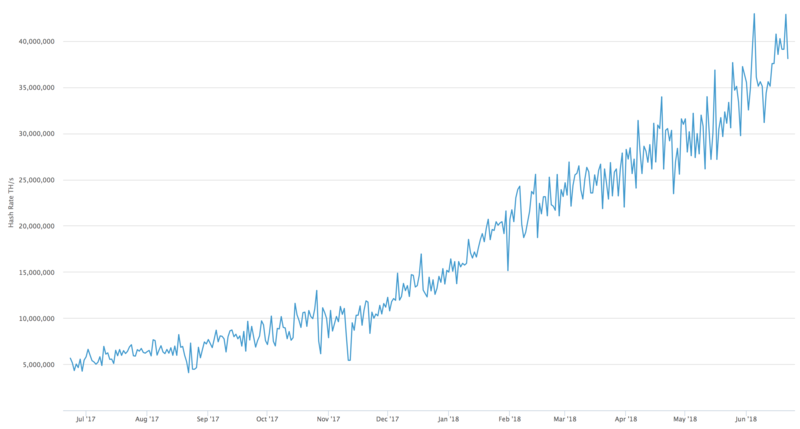 At some point, therefore, the hashrate should start falling somewhat, as it did in 2014-15, because it may become unprofitable for miners to have at least some of their hardware still running. It is during those periods when one miner tends to start dominating because new miners have not yet entered, while old ones are leaving. That situation is temporary going by past experience because at some point miners stop selling and start surviving on reserves in order to stop putting downwards pressure on the price. Looking at all these stats, that point might not be far off, although the still increasing hashrate does somewhat contradict that suggestion. Regardless, bitcoin might have to prepare for a potential and foreseeable scenario where one miner dominates especially in light of the Lightning Network potentially complicating matters as far as the extent of damage that one dominating miner can cause intentionally, unintentionally, or perhaps because they have been coerced.